Russia: on and off the beaten track: Valday 1 - the hilly upland of glacier origin between Moscow and Saint-Petersburg. Valday 1 - the hilly upland of glacier origin between Moscow and Saint-Petersburg. Although the distance form Moscow to Saint-Petersburg is only 700 km, the trip from Moscow to Saint-Petersburg by car may take from 10 to 14 hours. 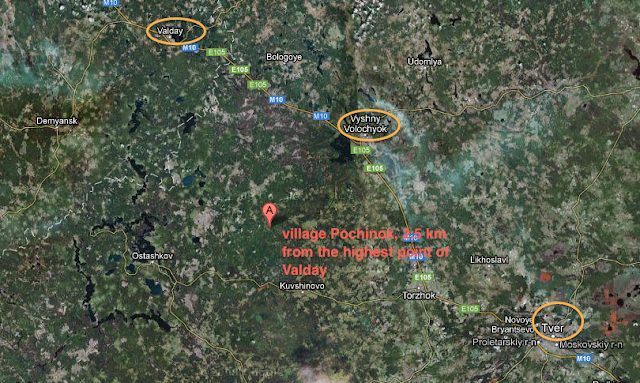 All because of horrific traffic jams first in Moscow, then - in Vyshny Volochok, less - in Saint-Petersburg. The highway connecting the two capitals is surprisingly narrow - only three driving lanes. However, driving along the M 10, the connecting highway, is relatively safe. One can get a better understanding of Russia, enjoy the views and, the last but not the least, visit the Valday Hills. The Valday Hills were in process of formation 70 000 years ago during the last Glacial Period when enormous blocks of ice "ploughed" the earth in the area leaving us most picturesque lakes and ridges. At that time the water-parting for the Volga, the Daugava (Severnaya Dvina), the Dnepr was shaped. 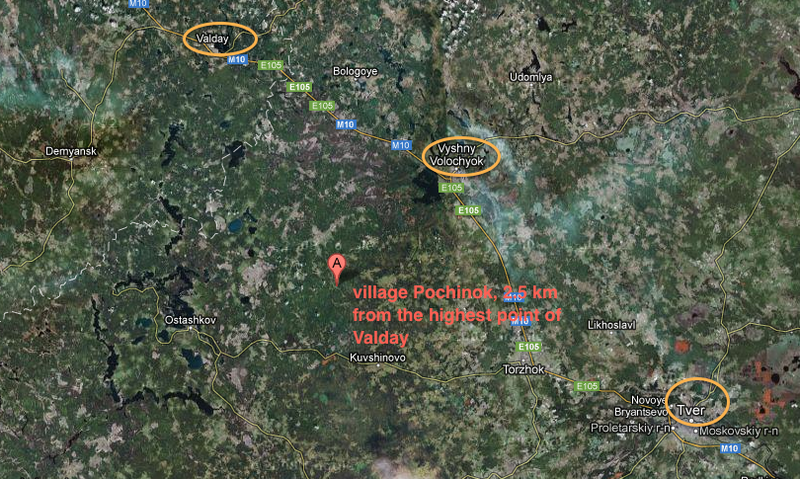 The highest point of Valday is 346.9 meters. On our way from Moscow we stayed overnight at the Priyut Okhotnika (The Hunters Retreat/ Приют охотника). On their site they advertise the possibility to stay at small hunters' huts at just 1.200 roubles per night which was a very reasonable offer in my view. At first I couldn't get though on the phone, given on their site. Well, my husband turned out to be more persistent and finally, he booked a cottage at ...4.000 (=100 euros) roubles per night. The huts at 1200 are not available in cold season. The receptionist could not say when they will be available. Inquire about them in summer, hope, they will put them up. We could quite easily find the place by the signs along the road. The place is awesome, the cottages (about 10-15 cottages) are scattered around the crystal clear lake. Our cottage has 2 tiny sleeping-rooms and a spacious living room with a fire-place and no wood for making a fire. It's actually for 4 people, but believe me, relaxing in a company of people who you don't know at all in such a small space is troublesome. On the other hand, it's quite economical for 4 people = about 25 dollars per person. A kettle, fridge are available. The view from our cottage on the 1st of May. Cold, year...? The cottage ( video) has some heating system, which is not enough for a fairy like me, but could be supposed even excessive for a brutal hunter in rustic hunting gear. At outside temperatures ranging from -2 to +15 I felt a bit chilly inside. The shower is so advanced that we both me (not taken into account when it comes to appliances and gadgets) and my husband (who has a degree in engineering) couldn't find how to turn on cold water. We had to mix both cold water from the sink tap and hot water sprinkling from the shower. I remember taking a shower of cold water in a cheap hotel in Sri Lanka: that was much more pleasant than taking a hot shower in Russia. So check shower and toilet before checking in. The cafe nearby is very tidy and cosy. The breakfast at 250 roubles per person was one of the tastiest and most substantial we've had. Fried eggs, a serving of salad, some FRESH cottage cheese with home-made varen'ye (much better than jam), fried eggs. Well, 4000 for a cottage + 250 (breakfast)+250 = 4500. They also have a banya (Russian sauna) which is conveniently (or rather inconveniently for me) situated nearby. Since I am a fan of having a cold plunge from time to time, the idea of plunging into the cold water after banya in public doesn't appeal to me. On top of that, taking a cold plunge after ban'ya has to be undertaken naked (that's what Russians do) and the banya is on the bank of the lake in front of all the cottages. The activity they specialize in is hunting, so that is what I hope they do properly. We are not into hunting, we like watching animals in their natural habitats. However, for those who are interested: according to the price-list, a one-day hunting trip is above 2000 roubles (70 dollars). Trophies have to be paid for additionally. From 200 dollars (5000 roubles) for the bore, to 700 dollars (20 000 roubles) for a bear's skin.